How can I manage my outsourcing expenses? This article is about managing your expenses that result from outsourcing jobs to suppliers. When you mark an outsourced job as 'Finished', the system automatically asks you if you want to create an expense. Click on 'Save'. 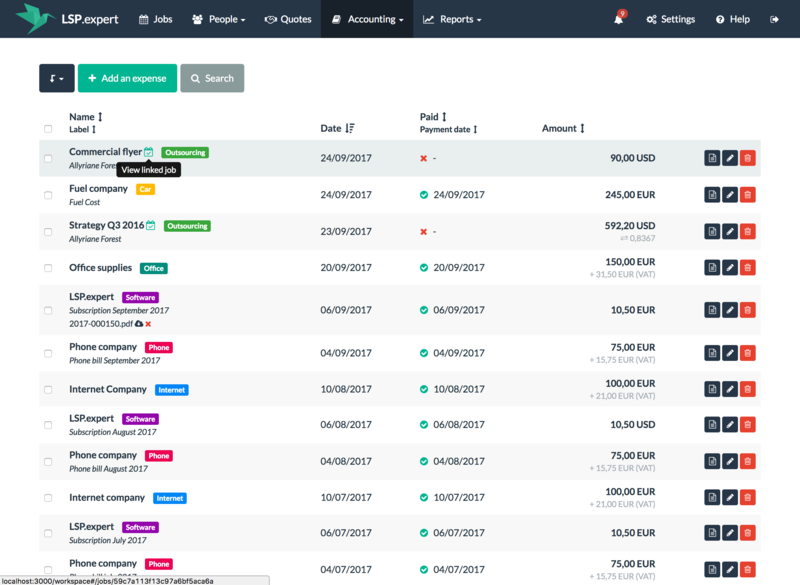 An expense is created and added to your list of expenses, with a green icon next to it to specify that it is linked to a job. This list shows the date of the expense, if it was paid (and when) and the amount. By default, all expenses will be defined as already paid. 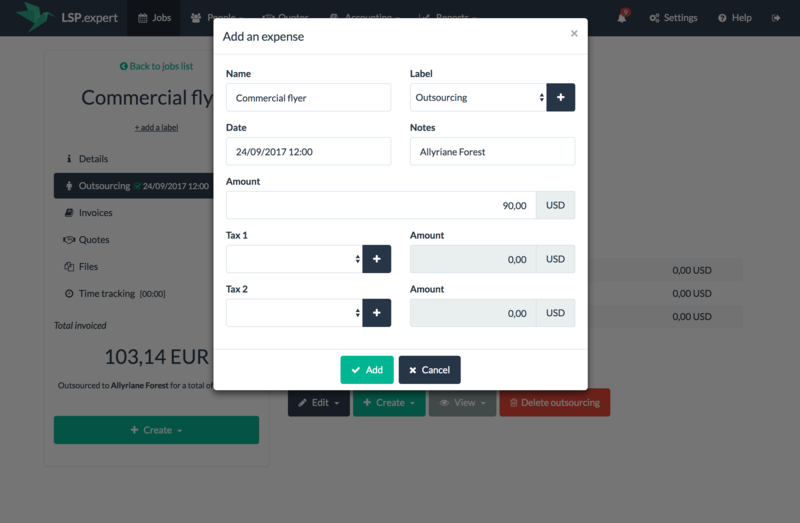 You can use the buttons on the right to edit the expense, delete it or upload a document for this expense. To define an expense as unpaid or to change the payment date, click on the little pencil on the right. When you upload a document for the expense, the name of this document appears below the name of the expense. That's where you can also see the notes you might have written concerning the expense (by default, the system adds as a note the name of the supplier to whom the job was outsourced). The arrow button allows you to archive the selected expenses. Below the amount of an expense, you can see the taxes applied to the expense and/or the exchange rate (icon with the two arrows). And of course, you can always use the filters to find what you're looking for in this list of expenses. If you click on 'Cancel' when the system asks you if you want to create an expense, note that you can always create an expense later by clicking on 'Create' > 'An expense' in the 'Outsourcing' tab of the job.